My very artistic niece sent me a link to a very cool rendition of Van Gogh’s ‘Starry Night’ that was recreated by an astronomer using Hubble images. 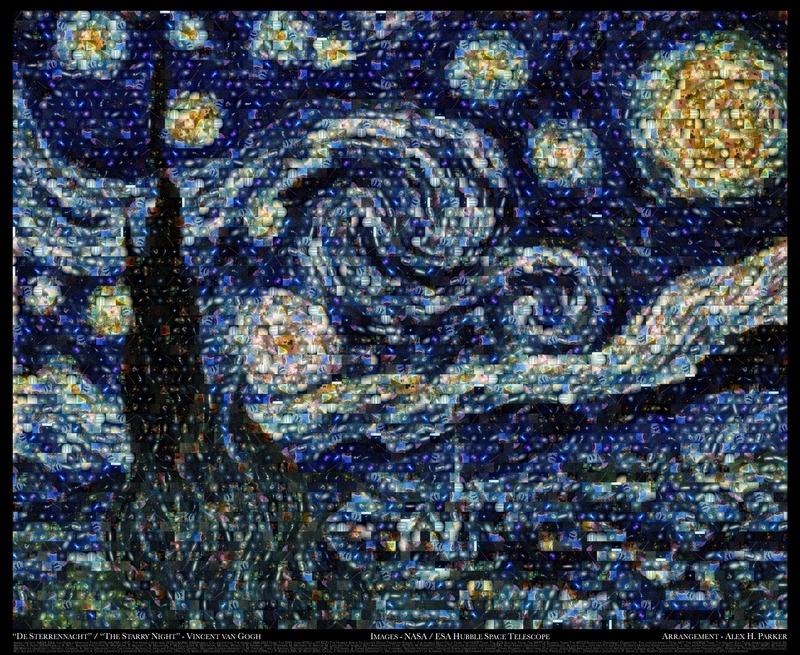 From the Open Culture Website: Last year, Alex Parker, a post-doctoral fellow at the Harvard-Smithsonian Center for Astrophysics, created a mosaic of Starry Night using 100 Hubble photos. Alex downloaded the photos from the European Space Agency’s website, popped them into a free digital art software package called AndreaMosaic to make the image above. The high-res image can be found here. The more challenging aspect of the image would be to figure out each of the little panels used to make the image. How many can you name without looking? Alternatively, I might use some of my own images and see what great works of art I can come up with. Come On Spring!!! - Blog - Meandering Thoughts -. Gorgeous and surreal! I wanna go! Normally, I show a lot of space related stuff (hence the name of the blog), but every once and a while you need to look inward at the beauty of our little (and I do mean little) part of the Universe. I want to go to Chile to visit the great astronomical telescopes high in the mountains. But after seeing these pictures, I have another reason to want to visit. Enjoy.